On the eve of this week’s Gate Safety Week - a campaign drawing public attention to unsafe gates - a company was fined half a million pounds after a man was killed by a gate in Wales. The sentence was imposed on wholesale company AF Blakemore and Son Ltd on Friday, October 7 at Cardiff Crown Court. The company admitted a breach of the Health and Safety at Work Act (1974). Delivery driver Ronald Hayward died when he was pinned under a 300 kg (660 lb) steel gate that collapsed at their premises in Newport. The company admitted failing to ensure that the gates and gateposts were maintained and were in working order. Gate Safety Week, which started yesterday (October 10) and runs until October 16, is being held to raise awareness of the dangers of poorly fitted and maintained gates. It is being organised by the DHF (Door & Hardware Federation), the powered gate industry body which is campaigning for higher standards of safety for automated gates and barriers. The DHF represents Britain’s leading manufacturers, suppliers, installers and maintainers of powered automatic gates and gate automation equipment. An earlier inquest into Mr Hayward’s death heard that the manual gate fell due to a failure of the hinge. The bolt fixing a bracket to an angle iron failed due to fatigue. The clarion call of Gate Safety Week is Safe Gates Save Lives. Campaigners are stressing that correctly installed and regularly maintained powered gates are perfectly safe to use. But like any machine, they can be dangerous if they are not installed or maintained to the highest standards. Gate Safety Week is the climax to a long period of activity designed to raise standards of gate safety. The DHF’s in-depth training scheme covers all aspects of powered gate safety including structural integrity and the minimization of risks posed by automation. It has seen almost 800 powered gate installation engineers successfully complete the course. June 2016 saw the launch of a new industry code of practice designed to reduce the safety risks associated with powered gates and traffic barriers to as low as is reasonably practicable. All DHF members must abide by the code of practice (DHF TS 011:2016) which provides a framework to ensure a gate is safe and therefore complies with the law. The National Security Inspectorate (NSI), the UKAS-accredited certification and inspection body which audits security and safety providers, is using DHF TS 011:2016 to audit installers and maintainers in its new powered gates certification scheme. 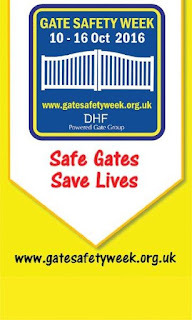 .For more information about what is happening during Gate Safety Week visit www.gatesafetyweek.org.uk.